US genre bending brothers Slightly Stoopid are making Australian in-roads with Sydney and Melbourne Bluesfest touring shows filling up fast. This loveable band of brothers are weeks away from blazing up their party friendly fusion of folk, rock, reggae, funk, hip-hop and blues in front of Australian audiences. Sticklers for remaining fiercely independent, Slightly Stoopid have amassed years of impressive and diverse support credentials alongside the likes of Snoop Dog, Sublime, The Roots, Blink 182 & N.E.R.D.. The sheer diversity of these line ups alone are proof Slightly Stoopid have an incredibly adaptable and unique sound. Known for their their slabs of dubby bass, meditative vocal harmonies, rock-steady guitar licks and tightly syncopated percussive rhythms, the San Diego based band unveiled their latest musical experiment Meanwhile… Back at the Lab through the band’s own Stoopid Records. 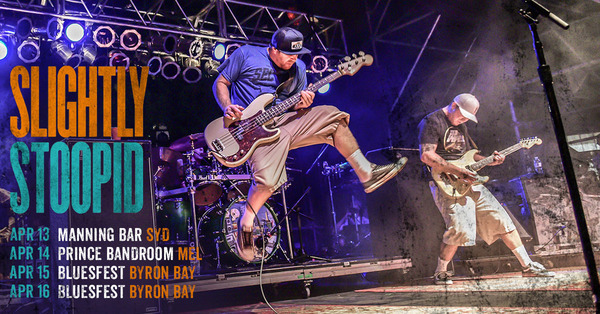 Slightly Stoopid will be joined by party starters Caravana Sun in Melbourne and Manalion in Sydney. Extremely limited tickets remain to both shows.